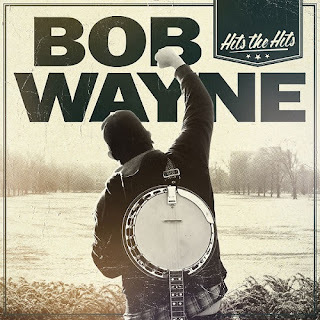 Hall of the Mountain King: Review: Bob Wayne, "Hits the Hits"
Review: Bob Wayne, "Hits the Hits"
Gambling is a dangerous game. Just ask Bob Wayne. You could go from refusing to perform covers, to doing a silly cover song because you lost a bet, to doing a whole album of covers. It’s a slippery slope. Wayne’s latest, Hits the Hits, all started with a lost bet that found him performing a cover of Meghan Trainor’s “All About that Bass,” his first ever. A few months later, and we have a 13-song collection of covers from the DIY country singer. Don’t expect any Johnny Cash or Waylon Jennings, even though they’d seem to fit his style more. On this collection, Bob Wayne puts his own spin on classic rockers like the Beatles, Rolling Stones, Led Zeppelin, Ozzy and Guns N’ Roses, along with some much stranger pop choices — like Adele, Rihanna and Gnarls Barkley. There’s even a Bob Marley tune in the mix. Not surprisingly, Wayne fares pretty well on the classic rock stuff. The biggest problem may be that he sticks too much to the title of the album, and many of these songs are ones that rock fans may be a little burned out on. I mean, I’m sure I’m not the only one that would rather hear deeper cuts than “Rock and Roll” from Led Zeppelin or “Sweet Child o’ Mine” from Guns N’ Roses. Wayne gives a surprisingly good turn, though, to Ozzy Osbourne’s “Crazy Train,” complete with the country singer’s trademarked train whistle shout. When I saw it in the track list, I thought there was no way that it would work, but it turns out to be one of the better songs on Hits the Hits. He takes the familiar heavy Randy Rhoads guitar riff and turns it into a honky-tonking fiddle piece, and gives the verse a more thoughtful spin with a steel guitar. His version of the Beatles’ “Come Together” also entertains with a little bit of a Johnny Cash chug behind the verse, and he turns the Rolling Stones’ “Sympathy for the Devil” into a fun hillbilly hoedown with a screeching fiddle that would make Charlie Daniels’ devil proud. Bob Wayne breathes life into a couple of songs that I really thought I’d never care to hear again in “Sweet Child o’ Mine” and the Red Hot Chili Peppers’ “Under the Bridge.” There’s really not a lot of change in the melody for “Under the Bridge,” but there’s something about the simple, honest delivery that Wayne gives the song. The same could be said for the Guns N’ Roses tune. The main riff becomes a swinging banjo and fiddle piece, and there’s a bit of coolness in Wayne’s delivery that brings a very different feel from the original. Not all of the rock tunes work out, though. His good-timing version of “Rock and Roll,” to me, is a little bland, and he just doesn’t have the smooth delivery to pull off Marley’s “I Shot the Sheriff,” even though there are parts of both that I like. The pop side is a little more hit and miss. There’s the aforementioned cover of “All About that Bass,” which is really just sort of a goof, but some of the others work amazingly well — particularly Adele’s “Skyfall.” Wayne turns the song into a clanking and driving nod to Cash, and the female vocals on the chorus work well with his low rumble. It might be my favorite performance on the whole record. Rihanna’s “Disturbia” has a mean edge to it that I like, and I think it turns out to be a great choice for him. I was disappointed, however, in his take on Imagine Dragons’ “Radioactive,” which is a song that I really like. Bob Wayne’s version lacks that dark, apocalyptic feel that makes the original so cool. It’s one of only a few songs that I think really loses something in translation here. Sadly, the one song that I’ve always wanted to hear Wayne cover doesn’t make the cut. I think Jack Kittel’s disturbing “Psycho” is tailor-made for the Bob Wayne treatment, and I’ve always wondered how he would handle it. Ah, maybe some other time. How about it, Bob? Hits the Hits, like many covers albums, is a lot of fun while it lasts. Certainly, no one can accuse Bob Wayne of not putting his own spin on anything that’s featured here. Will I still be listening to it a year from now the way I’m still spinning his last studio album Back to the Camper? Probably not. And remember kids, gambling is bad. Review: Armored Saint, "Win Hands Down"